At Ventura's Rubicon Theatre, Saturday, September 6. Shows through September 28. Mr. Maracek (George Ball) congratulates Amalia (Kim Huber) on her new job, while Georg (Kevin Symons) looks on skeptically. 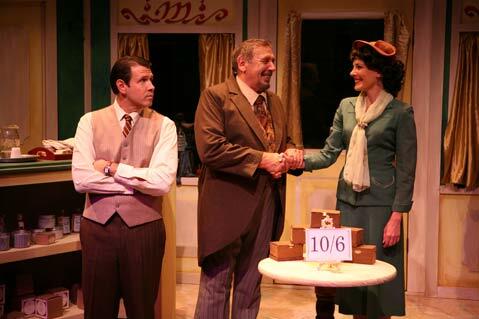 She Loves Me, which opened last weekend at the Rubicon Theatre and is running through September 28, is the final show of the company’s 10th anniversary season. This show’s classic romantic plot about professional rivals unwittingly corresponding as pen pals has spawned several film and stage adaptations during the last seven decades. First written in 1937 by Hungarian playwright Mikl³s L¡szl³, Parfumerie, it was most recently adapted as You’ve Got Mail, but it also was the basis for the 1940 film The Shop around the Corner with Jimmy Stewart and the 1949 movie musical In the Good Old Summertime starring Judy Garland. The current musical stage incarnation debuted on Broadway in 1963. This humorous and earnest story has been deftly interpreted by the director, Kirby Ward. The entire cast is to be commended on its charisma, professionalism, and polish. The majority of them are Equity actors who have worked extensively in film and television as well as on the stage. Especially notable were Kim Huber and Kevin Symons as the romantic leads, Amalia and Georg. Huber’s clear, strong voice and saucy yet vulnerable characterization of Amalia made the role endlessly engaging. Symons was reminiscent of one of the great actors who had preceded him in the role, namely the young Stewart. He has the same lanky boyishness, with a similar quiet smile and understated charm. Beverly Ward, in the role of Ilona, their fellow perfume shop clerk, was masterful in her portrayal of the brash, world-weary-yet still hopeful-single girl. Both her singing voice and comic timing were flawless. Another strong point, and a rare treat for a production of this size, was the live musical accompaniment. The four-piece ensemble, under the direction of Lloyd Cooper, lent a bright Broadway sound to the small space. Tom Giamario’s beautifully designed set rotated, alternately presenting the facade and interior of the perfume shop. The costumes, by Shon LeBlanc, provided a stunning parade of 1930s-era fashions, right down to the seamed and patterned stockings worn by the ladies. The final moment, when Amalia and Georg embrace at last on Christmas Eve under a soft fall of snowflakes, was a sweet reminder that love could always be just around the corner.